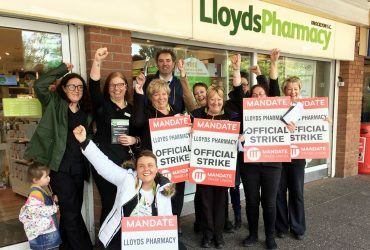 Mandate Trade Union has today (16th August) announced two more days of industrial action in Lloyds Pharmacy as their dispute over low pay, zero hour contracts and the denial of trade union representation continues. Up to 270 Lloyds Pharmacy workers in almost 40 stores across Ireland will continue their industrial action, scheduled to take place this Saturday, 18th August 2018 and Saturday, 25th August 2018. 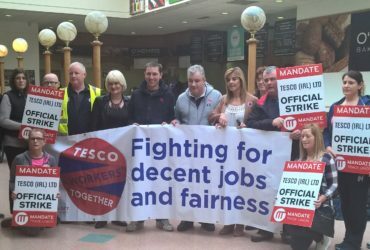 Mandate’s Assistant General Secretary Gerry Light said the strikes were inevitable following the company’s continued refusal to engage with the workers’ designated representatives. Mr Light dismissed the company’s claims that an internal representative body, referred to as the “CRC”, has negotiated improvements to conditions of employment. 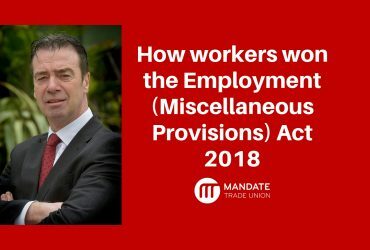 “Mandate Trade Union has received reports that Lloyds management deliberately distorted a recent vote on the company’s proposals by allowing up to 70 workers in head office to vote on other workers’ conditions of employment that have no bearing on them. If this is the case, it is nothing short of a scandal. “Furthermore,” added Mr Light, “we are hearing reports that not only did senior management have the potential to vote and maintain workers on inadequate terms and conditions of employment, but that they were encouraging other head office staff to participate in the ballot also. Mr Light concluded by saying: “The most recent gerrymandering of the vote on terms and conditions of employment for Lloyds Pharamacy workers, if true, typifies the dishonest nature of this company. The strike takes place as Lloyds management continues their refusal to implement a Labour Court recommendation which stated that the company should allow their workers trade union representation. A motion in the Seanad was unanimously supported by Senators calling on Lloyds Pharmacy to engage with the workers’ designated trade union, and the Minister for Business, Heather Humphreys has also called on the company to engage with the workers through their trade union. Lloyds Pharmacy workers have participated in seven work stoppages over the last two months with the 8th and 9th dates set for this Saturday (18th August) and next Saturday (25th August). A full list of striking stores is available here. The Company argues that it already negotiates with an internal staff representative body, the ‘CRC’, however this body was established by management, is funded by the company to the tune of €10,000 and has never allowed elections to take place.